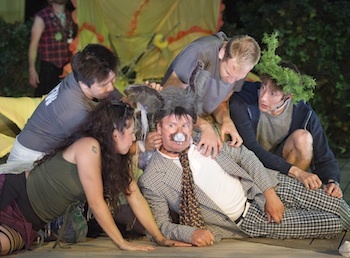 Canadian Stage presents Shakespeare’s A Midsummer Night’s Dream at the amphitheatre in Toronto’s High Park through September 2, 2012.
Who doesn’t like the romantic idea of seeing theatre under the stars? The Canadian Stage’s annual open-air Shakespearean production in High Park is a long-standing summer tradition. The event, formerly known as The Dream in High Park, has been re-branded for its 30th anniversary as Shakespeare in High Park. Seeing as it’s such a long-running event, I’m a bit embarrassed to admit I haven’t actually been to it until now. I keep saying every year that I mean to check it out and finally decided that this was the year I’d finally schlep out to High Park to make it happen. I really like how Canadian Stage strives to make theatre accessible to new audiences with this event. The outdoor show is family-friendly, admission is pay-what-you can, you can bring blankets to sit on and picnic. The show is an abridged version of the play which clocks in at Disney-movie-length 90 minutes with no intermission. I suppose that’s a fair criticism but I also think that there are few Shakespeare plays that would be a better fit for the outdoor setting of the High Park Amphitheatre than the lighthearted comedy-of-errors featuring young Athenian lovers and mischievous fairies in the enchanted woods. The play may be oft-performed but the production this year is new. Director Richard Rose’s vision for Dream is a barely coherent pastiche of incongruent styles across cultures and eras peppered with random Canadiana. I was never quite sure where the play takes place or when it’s set. Luckily, the show is such an uproariously good time that the weird mishmash of styles matters less and less and the show starts to make sense in a strange way. Rose adapts the play’s characters in some unexpected ways; Lysander (Eric Morin) is a young rocker who could’ve been plucked out of Rock of Ages, Helena (Sarah Sherman) is a speed walking busybody in yoga pants, and Demetrius (Ali Momen) looks like he could be a junior financial analyst on Bay Street in three-piece-suit. Then there’s Oberon, King of the Fairies (Dmitry Chepovetsky) who appears as a snarling kilt-wearing satyr and Titania, Queen of the Fairies (Tamara Podemski) who totes around a hand sack full of babies. The Mechanicals who put on the play-within-the-play really stole the show for me. John Cleland gives a wonderfully hammy performance as the hilarious diva Nick Bottom and Pierre Simpson’s character Pierre La Coing had me rolling with laughter with his exaggerated French-Canadian accent. Though this adapted version takes many liberties with the play, in a sense it’s truer to form than a highly polished production you’d see at Stratford. It more closely resembles the experience of the Elizabethan theatre of Shakespeare’s time; it takes place outdoors, audiences members are allowed to eat, the play makes contemporary references and, above all, it is accessible. For people who’ve never seen a Shakespearean play before and who might be slightly intimidated at seeing a show performed in ye olde English, the actors deliver the lines in a contemporary style, using tone and inflection so that even if you can’t discern all of the Shakespearean language you can still completely understand the gist of what is said from the way the lines are delivered. Even though I’ve seen several productions of A Midsummer Night’s Dream in the past, rarely have I seen a version that’s this unabashedly fun. I regret missing out in the past and I can definitely see Shakespeare in High Park becoming a regular event in the coming years. It’s a great way to spend a summer evening, I highly recommend it. Shows run Tuesday to Sunday at 8:00 p.m. Gates open at 6:00 p.m.
Photo of Tamara Podemski, John Cleland, Richard Lee, Mark Crawford, Pierre Simpson in A Midsummer Night’s Dream. Photo by Chris Gallow.